The Employee Audit Trail Report application enables you to track changes made to sensitive payroll data entered into the change mode of the Employee File. 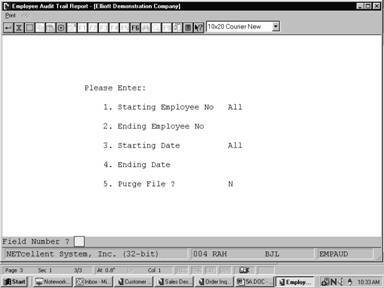 In order to obtain an audit trail report, the PR Setup file flag must be set to Y. If this Flag is set to N then there will be no audit trail of changes. 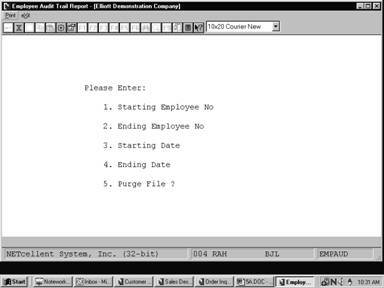 Enter the starting employee number to specify a range of employees to print on the report. If you press RETURN for the entry of the Starting Employee No., the field will default to All employees, and the entry of the Ending Employee No. will be skipped. If you press RETURN for the entry of the Ending Employee No. the field will default to the same value as entered for the Starting Employee No. Enter the beginning date of the period for which you want to print the report. If you press RETURN for the entry of the Starting Date, the field will default to All and the entry of the Ending Date will be skipped. If you press RETURN for the entry of the Ending Date the field will default to the same value as entered for the Starting Date. 1. 0004 05/29/92 13:52:22 B 28. 1. 28. 17. 126.93 1. 2,739.00 28. 2. Meddles, Shari B 29. LA 2. 29. 18. 201.23 2. 162.00 29. 3. 990 Schorck Road 30. 1 3. 30. 19. 3. 2,739.00 30. 4. Los Angeles 31. 2 4. 31. 20. 30.45 4. 2,739.00 31. 5. CA 32. 5. 32. 21. 5. 2,739.00 32. 6. 43329‑9910 33. 6. 33. 22. 33.19 6. 2,739.00 33. 7. 673‑09‑2882 34. 100.00 7. 23. 200.00 7. 2,739.00 34. 8. 01/01/55 35. 8. 34. 24. 16.00 8. 2,739.00 35. 9. M 36. 9. 35. 25. 2.00 9. 36. 12. 01/01/92 39. N 12. 1. 160.00 28. 5.00 12. 14. H 41. 14. BC Bluecrs 3. 2.00 14. 19. F 46. 19. W 1 8. 1,659.00 19. 20. 47. 20. 9. 162.00 20.